I swear since social media has become a regular part of our lives we seem to come across more and more stories of scammers getting caught. With the invention of instagram photos and videos have become crucial in many people's lives. Showcasing your life in the best light not only in words through a status but in photos of you wearing your best fashions and in videos showing you at your best angle. We've become accustomed to seeing our favorite celebrities flossing on social, wearing Fendi, Gucci, Prada, faces beat, and wigs snatched. Some of us have began to believe we must also portray the same kind of perfect life style. You know the lifestyle I'm talking about, the one where you spend your summers on yachts, the one where the photographer always seems to catch you 'doing business', or catch you at that perfect angle posted up in NYC. I swear since social media has become a regular part of our lives we seem to come across more and more stories of scammers getting caught. The invention of instagram not only brought us closer together but is has made photos and videos become crucial in many people’s lives. Showcasing your life in the best light not only in words through a status but in photos of you wearing your best fashions and in videos showing you at your best angle. We’ve become accustomed to seeing our favorite celebrities flossing on social, wearing Fendi, Gucci, Prada, faces beat, and wigs snatched. Some of us have began to believe we must also portray the same kind of perfect life style. You know the lifestyle I’m talking about, the one where you spend your summers on yachts, the one where the photographer always seems to catch you ‘doing business’, or where your ‘off guard‘ photos seem to be flawless. The motto has become “Why work for it when you can scam for it?” There have been 2 iconic cases of scammers being ousted by social media within the last year that come to mind. One being the ‘flawless‘ fashion blogger who seemed to have it all together. Her photographer and videographer would always follow her around and catch her at the perfect angle which would capture the perfect glimpse of red at the bottom of her Louboutins. 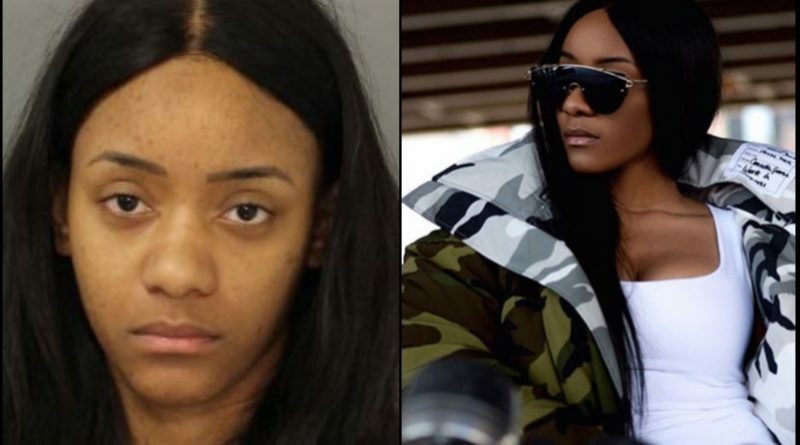 Shaniqua Jordan (also known as simplicityxstyle) was arrested for identity theft last year after one of her alleged customers notified police after $37,000 of charges had been ran up on her credit card bill. The charges led back to Jordan in NYC. Shaniqua had over 60,000 followers on her instagram account and was never shy about broadcasting her ‘best life’ to the world. Her filter free mug shot showed the ugly truth of the lifestyle she tried to fool people into believing was real. Jordan hasn’t updated her actual website since last February when she was arrested. Her instagram page’s comments have been deactivated and hasn’t been updated since July 2017. The curtain was lifted and the facade has since been replaced with the horrendous truth. I’m guessing the days of the ‘broke’ college student, living on ramen noodles, and scrapping change together and practically living in sweats are over. With the inclusion of social media in our everyday lives millennial’s seem to feel the pressure of appearing to of acquired financial wealth before they even stat their careers. News broke today of a Howard University School of Law student Tyrone Hankerson who was caught stealing $426,000 in financial aid money for over 4 years while working in the school’s financial aid office as a student employee. Tyrone stole money, not to pay his school loans or bills but apparently to portray himself on social media ‘living his best life’. Tyrone much like Shaniqua had a full on media team. He hired a videographer and a photographer to photograph him wearing expensive fashion pieces such as Gucci, Prada, fur coats and much more. He was even photographed on a yacht and on vacation. 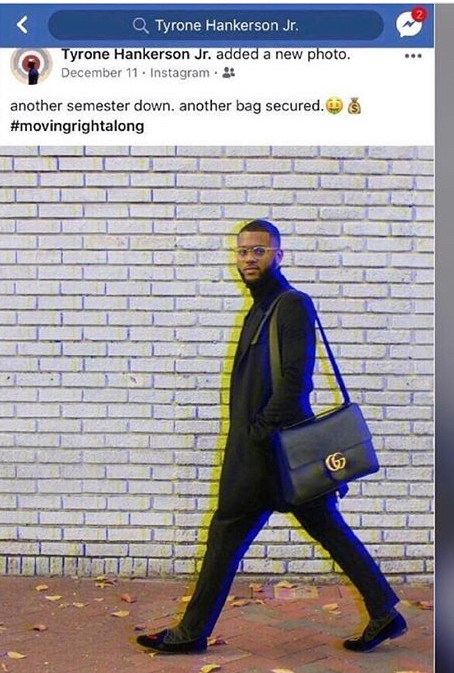 The brother even photographed himself wearing a Gucci bag with the caption “Another semester down, another bag secured”. *Emoji crying laugh* He secured the bag alright, the bag of someone else’s FAFSA money. I’m assuming due to the embarrassment he’s deactivated all social media accounts. There are still remnants of his social media activity online along with hilarious memes galore. The ridiculous part f both of these stories is that for these two individuals to have been stealing money they didn’t decide to ‘lay low’ they didn’t try to be inconspicuous. They demanded more attention from people which is ultimately lead to them getting caught. Let this be a lesson to all of us, work for your money instead of stealing it because eventually you’ll get caught and the humiliation will be harder to bear than the financial struggle once was.